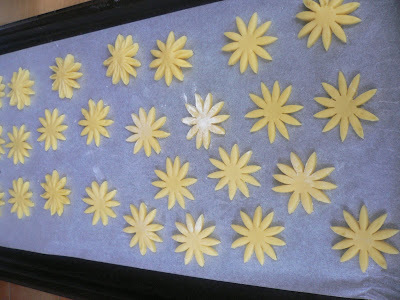 Alessandra Zecchini: More Christmas Biscuits! I am on a roll with biscuits! 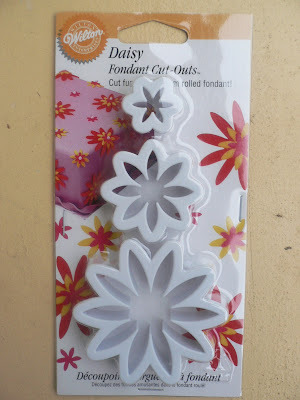 I use them as little Xmas presents for friends...and I wanted to try my other cutters from Wilton...so cute! I used the same pastry of the Xmas Tree Biscuits, and as you can see flour was needed from time to time as the dough got sticky! 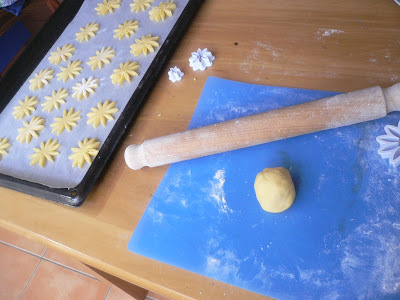 When I could not roll any more pastry I started to shape some biscuits by hand. 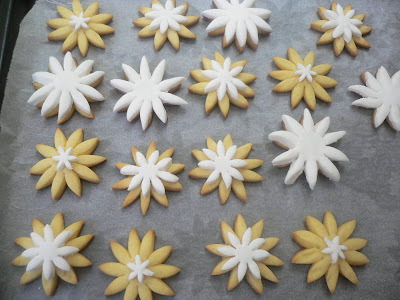 After making the Christmas Tree Biscuits I made these stars (below) which I decorated with white chocolate and yellow icing. 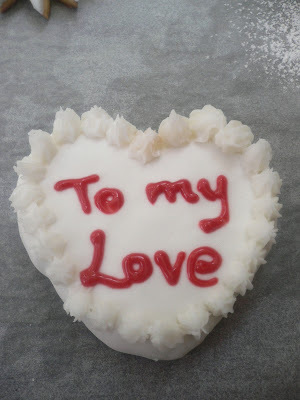 Yesterday, instead, the last bit of pastry became a big biscuit for my husband (iced like a miniature cake). 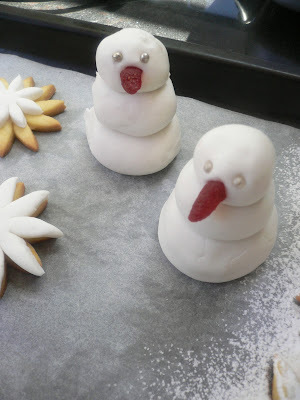 And the left over fondant was given to the children, who made these cute snow men! Now, today I have to extract the winner of the book. But my kids are at an art workshop all day, so I will write the names on pieces of paper in the meantime, and then wait for the little ones to come home and pick one. Good luck to all! 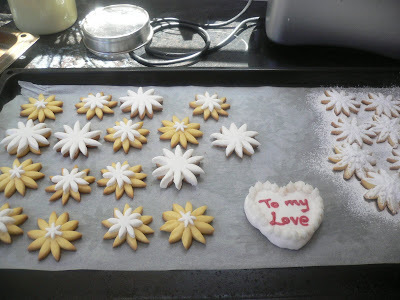 I'm hoping Santa is bring me some cookie cutters for Christmas :) One can never have too many I feel - heh heh! Hei! you just made it to get into the draw for the Sweet As book!!! Congratulation Yari, I will let you know, and also put this message on the book competition post. Thank you to all for entering, Next month I will organize another book and competition, if you like! Fantastic cookies. I love the shapes. Re you comment to Muso over at mine. I think he is a spammer. I edited the comment so it remains there but without the URL link it won't assist in his SEO. Have a wonderful Christmas Alessandra. A milano fa freddo freddo ed abbiamo 30 cm di neve...forse oggi si alzano un po' le temperature, ma danno ancora neve! These all look great! 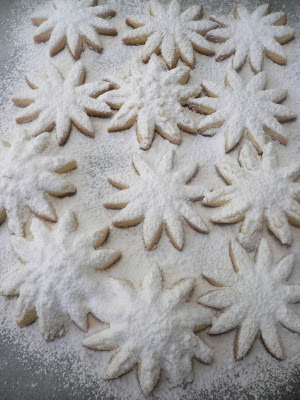 I'm making lots of cookies as well...spicy ones are my favorite this time of year. @ Barbara: what a cheek that muso! Merry Xmas to you too! @ Saretta, dai che mi manca il natale con la neve...simpatico il tuo risotto! @ Alice, posterai i tuoi biscotti? I won ;-) Thanks for the contest, I'm looking forward to getting your book! And merry Xmas everybody!